Catholic church is the most "common" church in the Czech Republic today. What its structure looks like? What are the smallest units and what are the largest ones? And what are the "ranks" of priests? There are two church provinces - Bohemian and Moravian. 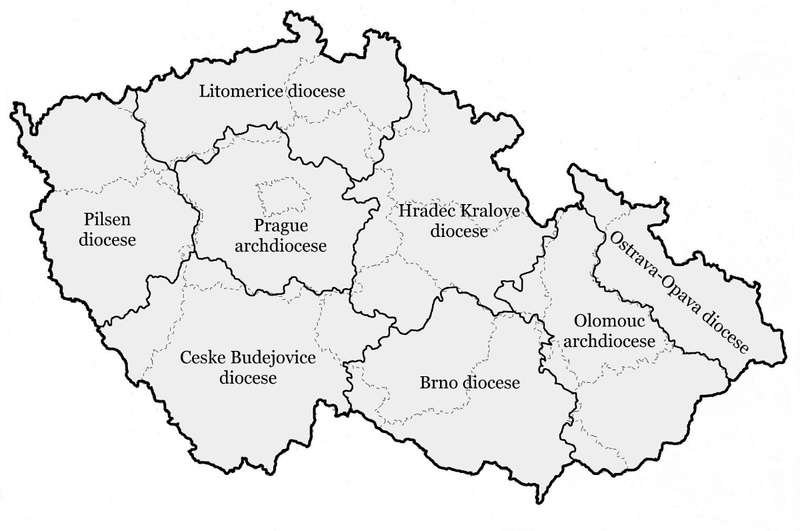 Both are divided into (arch)dioceses - two archdioceses are located in Prague (Bohemia) and Olomouc (Moravia) and six dioceses in Litomerice, Pilsen, Ceske Budejovice, Hradec Kralove, Brno and one a bit special has its seats both in Opava and Ostrava. Every diocese is divided into deaneries (deanery) which are led by deans. Every deanery is divided into several parishes which are led by vicars. One parish consists of several villages or town districts. Large towns as Prague or Brno have many parishes, smaller towns have usually one or two of them. It was common in the past that one vicar usually takes care for one parish church and one or two local churches. Situation got unfortunately worst as there are not enough priests to cover all parishes, so it's not unusual that one vicar takes care for two or three parishes (for example parishes in Drhovle, Čížová or Kestřany are administered from Písek). Vicar gets assistance from other priest in the parish. These are differents words used to describe them in the registries as kaplan, kooperátor, kurát or administrátor, but meaning is the same - chaplain, the one who helps vicar to take care for his parish. There usually were two or three of them in one parish in past. Is the Uherce the only Catholic Czech parish for the Line`area? The town listed on passenger record is Liny so Line`is the only one close to that I've found. Thank you. I'm researching the Prusiny parish records. Can you explain what the columns for Rodice and Pokrtence each include?